Businesses and individuals invest a lot of time and effort keeping documents organized. By installing additional document processing software to a computer, users are armed with significant workflow advantages. Those who work with digital solutions such as PDFfiller, know about the numerous useful tools available. Becoming familiar with simple features such as the rearrange PDF pages tool can end up saving hours of headache. 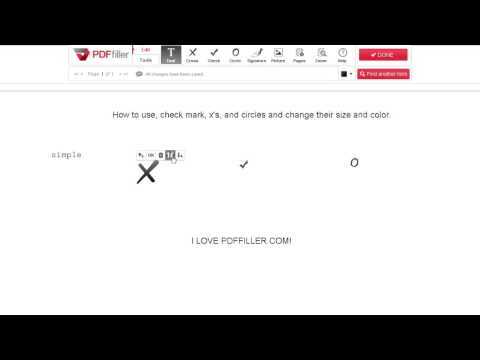 The PDFfiller online solution helps everyone rearrange PDF pages online in a few easy steps. This solution offers a number of added security measures with a combination of various functions corresponding to the need of every customer. 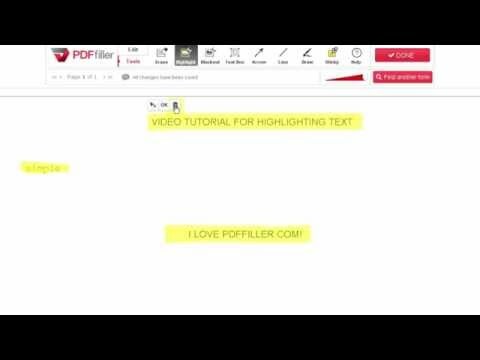 On top of that, the online PDF creator works on any computer running Mac or Windows, as well as most mobile devices. This allows users with an active internet connection to edit samples while on the go. The customer should upload a file to their personal PDFfiller account. The file should not exceed more than one hundred and fifty pages. Select one of the uploaded variants and add the sample to your account. 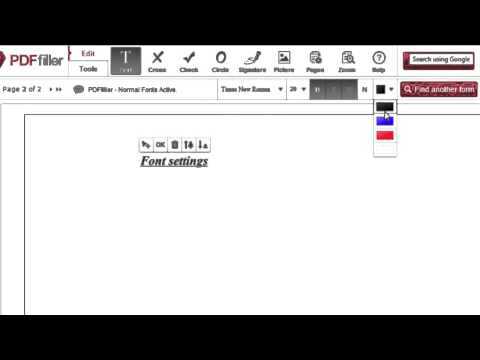 Next, the user may select the PDF page rearrange tool within their template or combine several documents into one. Those looking to compile the data from several samples may go to “Mybox” and merge up to five samples into one. Open the merged template to manage its parts. Review a PDF file, remember the number of pages you want to replace and their intended positions. Click the preview menu on the left-side. Select the pictogram with a gear-wheel and a pop-up window will appear. 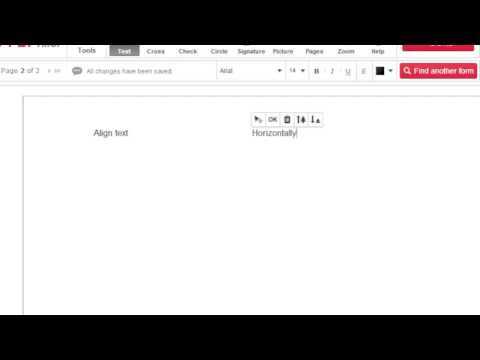 Rearrange pages in PDF by moving them left or right. To relocate them to a different place in the template, click “Move to” and type in the page number. If some text or images have the wrong orientation, select the “Rotate” tool to adjust them. Save the order and orientation of PDF pages by clicking the “Apply” button. Sort pages, edit content and change the position of document elements in seconds with PDFfiller’s multi-functional toolkit. After trying our trustworthy and user-friendly interface, you’ll wonder how you ever processed a single PDF document without it. 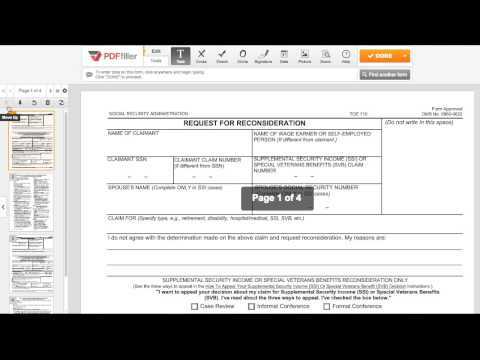 Can I amend (alter, correct, change, modify, revise, redact, rearrange) a document? Yes. 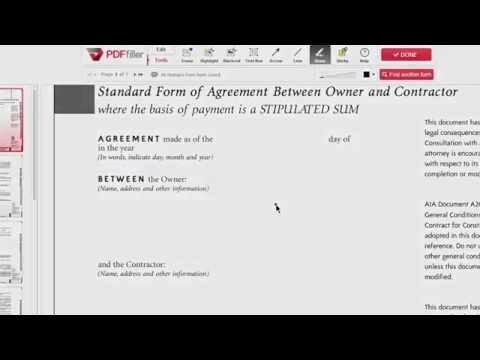 PDFfiller.com allows you to amend (alter, correct, change, modify, revise, redact) any document with our various tools and features. You can rearrange, rotate, and delete, the pages. You can also, add text, images, and signatures to each page. How do I rearrange pages in a document? Select "Pages" button in "Editor" page. It is signified by a set of gears. From here, select the page you wish to move. Click the left arrow to shift the page to the left, and the right arrow to shift it to the right. If you wish to undo your changes, select "Restore". How do I alter pages in a document? Select "Pages" button in "Editor" page. It is signified by a set of gears. From here you can move pages to the left or right, rotate them clockwise or counterclockwise, or delete pages. If you wish to undo your changes, click "Restore". How do I manage the page order of my documents? How do I reorder pages within a document? Select "Pages" button in "Editor" page. It is signified by a set of gears. From here, select the page you wish to move. Click the left arrow to shift the page to the left, and the right arrow to shift it to the right. If you wish to undo your changes, select "Restore." 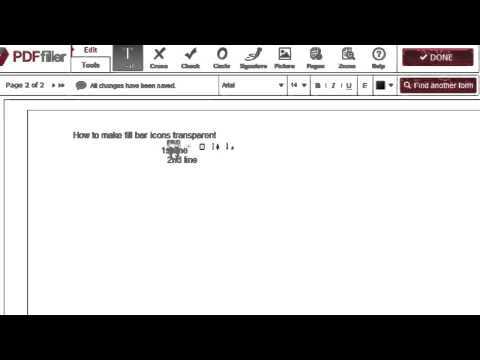 How do I collate a document? To collate multiple documents into one document, select multiple documents in "My Forms" by holding down on "Control" key on windows or "Command" key on iOS, and clicking on the documents you wish to merge. Then select the "Merge" button, signified by 2 arrows merging into one arrow. Reorder your documents by clicking the up and down arrows on the right hand side. Then click "Merge". Can I revise documents once I'm finished? You can always revise your document. They stay in "My Forms" page until you chose to delete them. 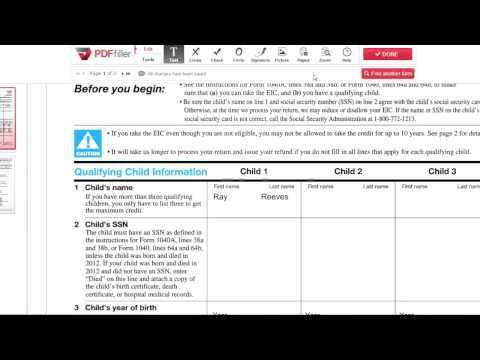 Select the document at any time and click "Fill" button to revise it. How do I erase a page within a document? Select "Pages" button in "Editor" page. It is signified by a set of gears. From her select the page you wish to delete. Then click the X button. If you wish to undo your changes, select "Restore". How do I remove a page in a document? Select "Pages" button in "Editor" page. It is signified by a set of gears. From her select the page you wish to delete. Then click the X button. If you wish to undo your changes, select "restore." How do I delete a page in a document? Can I cut pages from documents? Select "Pages" button in "Editor" page. It is signified by a set of gears. From here, select the page you wish to delete. Then click the X button. If you wish to undo your changes, select "restore". How do I rotate the pages in a document? Select "Pages" button in "Editor" page. It is signified by a set of gears. From here, select the page you wish to rotate. Click on the half circle arrows to rotate clockwise or counterclockwise. If you wish to undo your changes, select "Restore". How to merge several documents into one? Select several documents using Control-Click. 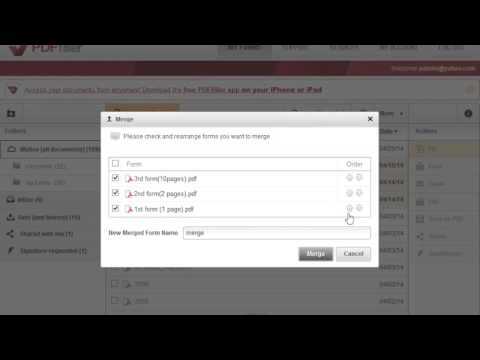 Click on "Merge" Button on the top in "My Forms" page. You will see a dialog box that lists all the selected documents. You will be able to change the order of the selected forms by using the up and down arrows. You can also change the order of the forms by dragging-and-dropping the forms up or down. When you are done rearranging the order of the forms, enter a name for the new merged form. Then, Click Ok.
How do I combine multiple documents into one document? Select multiple documents in "My Forms" page by hold down on the control key on windows or the command key on iOS, and clicking on the forms you wish to combine. Then select the "Merge" button, signified by two arrows merging into one arrow. Reorder your documents by clicking the up and down arrows on the right hand side. Then click "Merge". How do I assemble a new document? 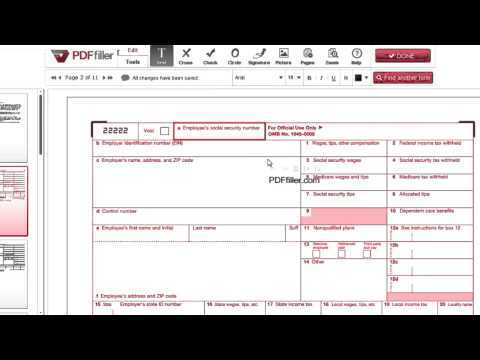 To assemble a new document in PDFfiller.com, select the "Add New Form" button to upload a document from your computer or the web, or the "find a form" button to search for your form in our PDF Search Engine. Can I lengthen a document? Yes, you can add blank pages wherever you would like within a document. In "My Forms" page select the document you would like to add pages to, and then click "Add Empty Pages" button. This button is signified by a page with a plus sign on it. Add multiple blank pages by specifying the number of pages you would like to add in the drop down menu. If you would like to add more than five pages, repeat this process until you have a sufficient number of pages. How do I insert a page into a document? 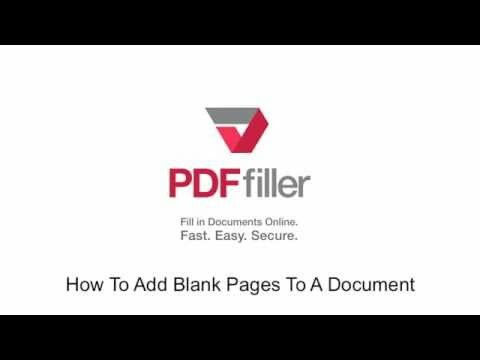 Add blank pages wherever you would like within a document. In "My Forms" page, select the document you would like to add pages to, and then click "Add Empty Pages". This button is signified by a page with a plus sign on it. Add multiple blank pages by specifying the number of pages you would like to add in the drop down menu. If you would like to add more than five pages, repeat this process until you have a sufficient number of pages. How do I trim a page in a document?